Community forum for Adent.io products. Here, you can update all your website details such as logo, favicon. Title, Meta tags , Footer details and Google Analytics. * website logo - follow the logo size 280*60 to make it look nicer on the website. * Favicon - This will be the small image that you see on your browser tab for your website. * Site title - Setup your website title - website name - if you want to add a keyword rich title etc. * Add meta description and meta keywords - If you’re going niche based site - then this should be an important place to update it. NOTE : If you don't see the changes reflect in the front end - Please use Clear cache button in the admin settings. * Setup Site footer text and logo. * Google analytics code - here you can enter your Google analytics code. If you’re wondering what Google analytics is - it shows how many visitors visited your website, for what keywords they visited your site, what are the pages they visited, how much time they stayed on your website etc. You can signup directly on Google analytics, add your site, get the code and paste it here. * Code - You can integrate any plugin/app with the script using its code by entering it in this option. You can edit the details of any video already added from this menu and also delete them. Using the create new menu, you can embed videos onto the website from other websites. 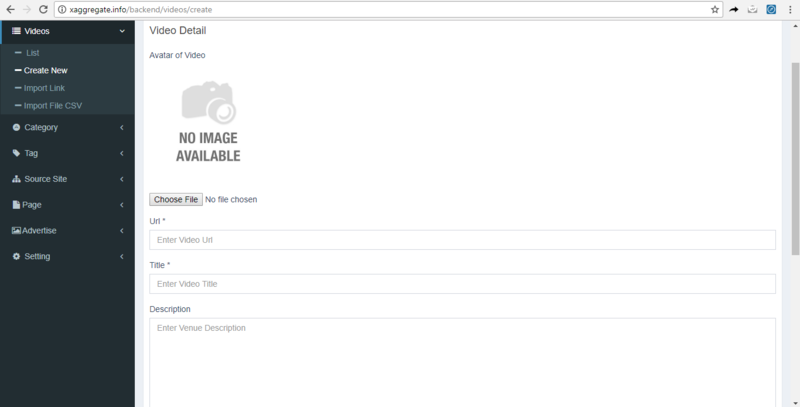 You can choose the the image for the video and add Title , category and tags to it. Set it as active, the video will be shown on the frontend. In this menu, using the CSV links provided by the mentioned websites, videos can be imported to the website. In this option, you can import videos from the given source sites using their CSV file. Select the source site and the CSV file and click update. When you enter this page, you need to input the column nos. On the LHS into the matching rows on the RHS of the page. Please follow this demo video for tutorial. 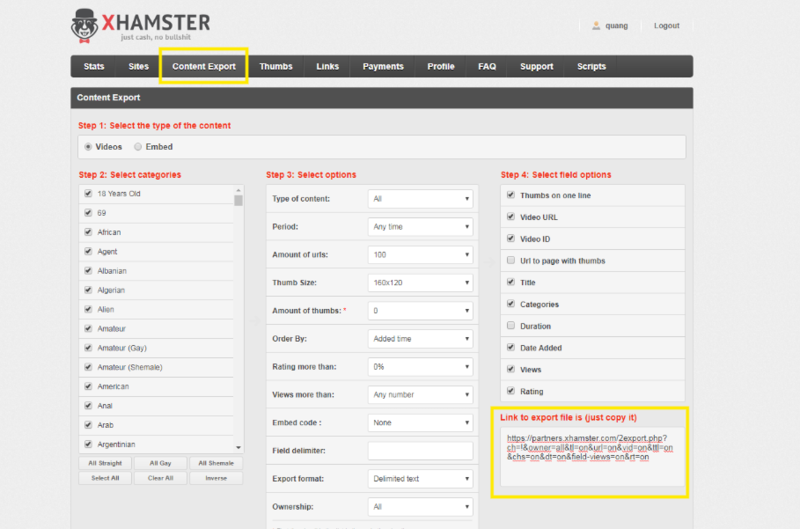 Under list of categories option, you can check the categories on your website, edit and delete the same. Here, you can create the categories that you want to have on the website. For each category, you can add the meta description individually that would help for the websites SEO. 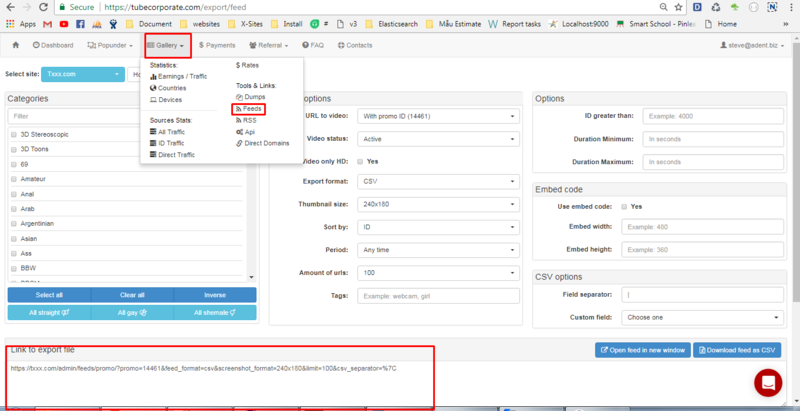 Under source site menu, you can check and edit details of all the source sites that are integrated with the website from where you are importing the videos from . Under pages menu, you can create and edit the static pages that you want to have on your website. These pages will be shown in the footer area under information. You can add your ad banners to the website from this menu. Under list, you can edit/delete the existing ad banners on the website. To add a new ad banner to the website, select the Create new option. You have the option to upload the ad banner on the website at 3 different spots. Select the type , add the title and paste the banner link image. Or the script code of the ad banner. Sort the ad banner on the page as per priority. Keep as Active and click on Submit.